Voting for a spot in the Elite 8 is over. The final 8 teams have been decided. Time to vote for the Final 4! Unlike the NCAA tournament, all of the number 1 seeds (Medicare ESRD Benefit, HEMO trial, Captopril and MDRD equation) are alive and well. The HEMO Trial barely nudged over to the next round with an overtime victory over ALLHAT reminiscent of the Michigan win over Kansas in the NCAA Sweet 16. The Cinderella story is finally over for the Tolvaptan Terriers as the Captopril Vipers send them packing. The APOL1 group also had a close matchup with anti-PLA(2)R. It is up to the readers of eAJKD to make the push to the final 4. Vote early and vote often. 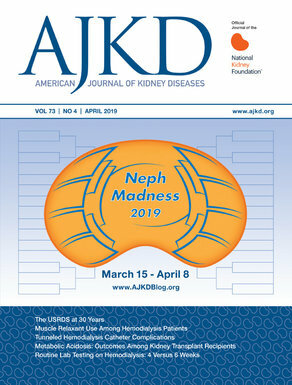 Only the readers will decide the ultimate champion in NephMadness. Don’t let your team down and vote them to victory. Polls open Saturday March 30th and close Monday April 1st at Midnight. To review each of teams click here. Click here for updated brackets. Voting for the Final 4 is open from March 30-April 1, 2013.